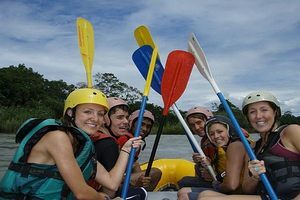 There is plenty of adventure to be experienced in Ecuador - from scaling to the summit of any of the volcanos along the "Avenue of the Volcanos," hiking through the Andes, riding on horseback from hacienda to hacienda, exploring the Amazon jungle, diving in the Galapagos, or water sports at the Pacific coast - there is something for every taste! 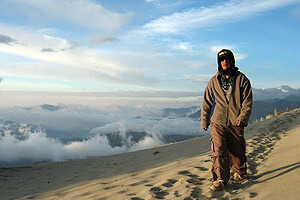 Click on the options below to find out more about the adventure trips on offer in Ecuador. Whether you are looking to scale a volcano, hike the Andes, go mountain biking or horseriding, we have the right trip for you . 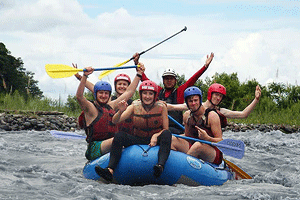 . .
Ecuador boasts some of the very best white-water adventure with all classes of rivers to explore. 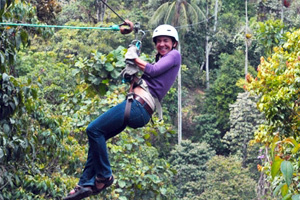 Or if you prefer tubing in the cloud forest . . . Known as the "adventure capital" of Ecuador, the town of Baños nestles at the foot of Tungurahua volcano, between the Andean sierra and the Amazon rainforest, an ideal spot for many adventure activities . . . Explore the cloudforests of Mindo where raging rivers cascade down through the misty mountains - hike, rappel, zip-line, go white-water rafting or tubing, and enjoy delicious fresh trout . . .